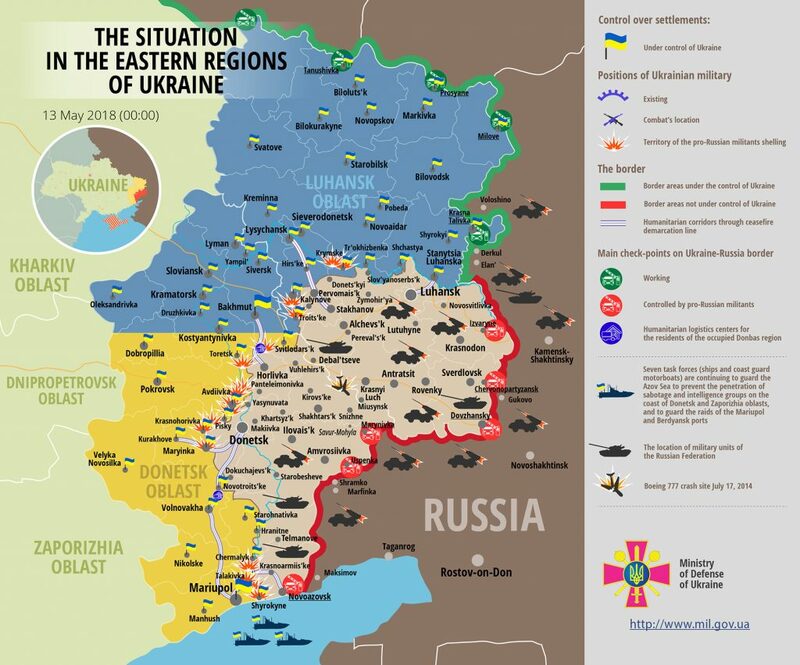 The situation in Eastern Ukraine escalated yesterday. 73 precise attacks of militants were recorded on May 12. Russian proxies carried out 31 artillery rounds of 122 mm caliber and released about 140 mortar rounds of 120 and 82 mm caliber. Since midnight on May 13, militants have already committed 12 attacks. One Ukrainian soldier was killed in action, six were injured. The Ukrainian troops returned fire 40 times, reported Col. Dmytro Hutsulyak, Ministry of Defense of Ukraine spokesperson, at a press briefing at Ukraine Crisis Media Center. On May 12, In Luhansk sector militants made 27 attacks. “The militants of the occupation administrations of the Russian Federation carried out 15 artillery rounds of 122 mm caliber on Novozavanivka. 16 artillery rounds of 122 mm caliber and more than 30 mortar rounds of 120 mm caliber were shot at Troitske”, – said Dmytro Hutsulyak. Russia-backed militants attacked Prychepylivka, Novozvanivka, Troitske, Zaytseve, Novhorodske and Zalizne with mortars of the 82nd 120 mm caliber. They used grenade launchers of various types and large-caliber machine guns against Ukrainian troops in Troitske, Krymske, Prychepylivka, Mayorsk, Novhorodske, Novoselivka, Zhovte. 7 times militants attacked Novozvanivka, 5 times – Zaitseve area. Right after the midnight on May 13, Russia-backed militants fired 40 mortar rounds of 82 mm caliber on Ukrainian troops in Novhorodske. At 05.00 a.m. they started a long firing on Svetlodarsk using artillery of 122 mm caliber, and mortars of various calibers. In Donetsk direction, militants carried out 46 attacks. “The enemy used mortars of 120 and 82 mm calibers against Ukrainian troops in Kamyanka, Verhnyotoretske, Avdiivka. They also used different types of grenade launchers, large-caliber machine guns, and small arms. Hostile shelling was recorded near Avdiivka, Hnutove, Kamyanka, Vodyane, Maryinka, Verhnyotoretske, Pavlopil, Krasnohorivka, Shyrokyne, Talakivka, Opytne, Nevelske, Pishevyk, and Shakhta Butovka”, – said Ministry of Defense of Ukraine spokesperson. Militant snipers fired upon Ukrainian positions in Pavlopil, Hnutove, Avdiivka, Opytne. Report on the military developments as of May 12 is available here. Interactive data on the shelling: chronology shelling chart and the interactive map.